The Rife Switchback XL putter, which combinines custom fit options with tour-proven face technology, has been unveiled. 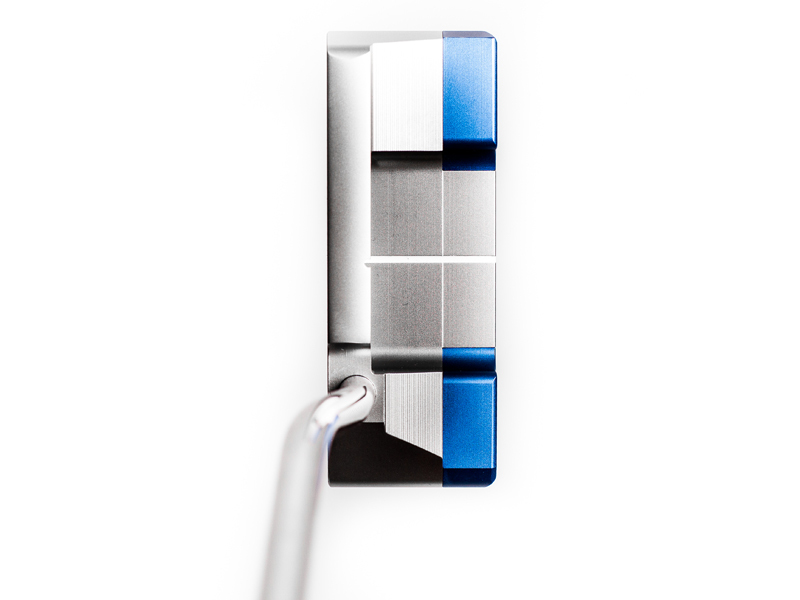 The lead technology in the Switchback XL blade is an adjustable weighting system on the heel and toe of the putter. With 10g (blue) and 30g (silver) weight options, the Switchback XL putter can be set up to 375g and 415g with equal weighting on either side. With split weighting, designed to promote a desired swing path, the total weight can be customised to 395g. The second custom-fit technology in the Switchback XL is Rife’s Lie-Aline fitting system. When purchased in store, the double-bend shaft can be adjusted by the retailer to set the perfect lie angle for the golfer’s set up. With the eyes of the golfer lined up directly over the back of the putter, the white alignment line matches up with the notch in the back of the club face (below). The lie angle can be set to match the golfer’s stance so they know every time the line sits in the notch the base of the putter is flat on the ground. The final technology in the Switchback XL is Rife’s RollGroove technology. Precisely spaced grooves, milled into the face of the putter, grip and lift the ball into a quick, true forward roll at impact – delivering accuracy and improved distance control. The Switchback XL – which allows every golfer to play with a putter set up to their personal specifications – comes in an oversize blade style, combining elements from both blade and mallet-style putters.